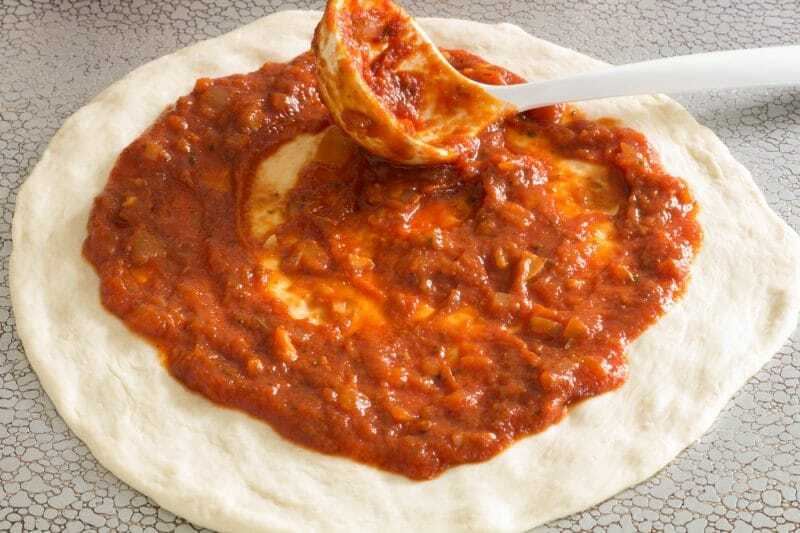 Easy Pizza Sauce Recipe loaded with Italian flavor is so simple that there is no reason to buy jarred pizza sauce again. Make a double batch and store it in the freezer. 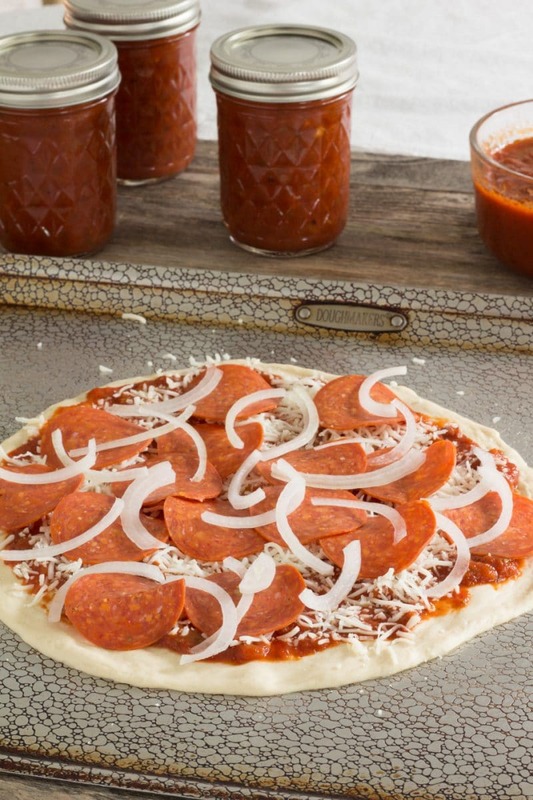 Not only is this sauce perfect on pizza but it is also great added to pasta! The secret to the best homemade pizza sauce recipe is to use both olive oil and butter when sweating the onions and garlic. 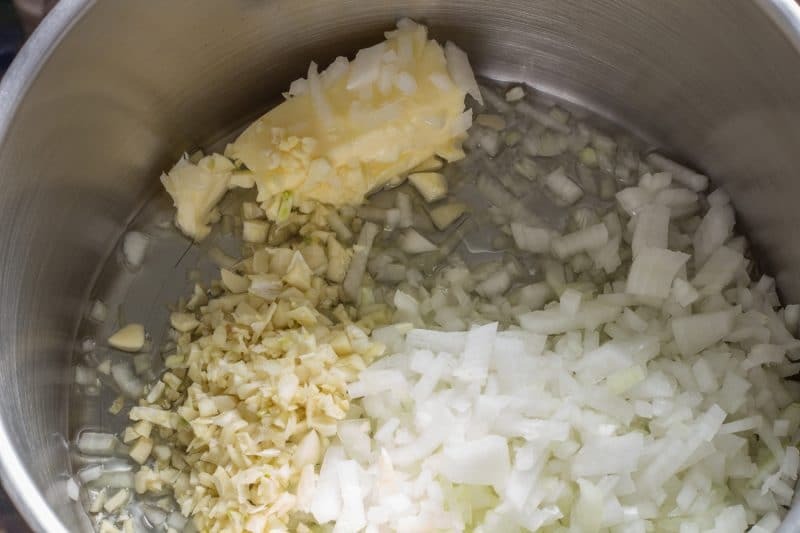 Start by slowly melting the butter with some olive oil over a medium-low heat. You don’t want to brown or burn them. The onions need about 5 minutes of cooking before adding the garlic. Adding the garlic too soon in the process might cause the garlic to overcook. Once the garlic has been added, just cook until you can smell the garlic. We really do not want to overcook the garlic. Use the freshest garlic available. Old garlic can be bitter before you even add it to a recipe and have the chance to burn it. Cooking the onions and garlic are the hardest part of this recipe. Once that is done the tomato sauce, tomato paste, and spices are added and simmered. I add water to my sauce because I prefer the flavor after it has been simmered for a few hours. 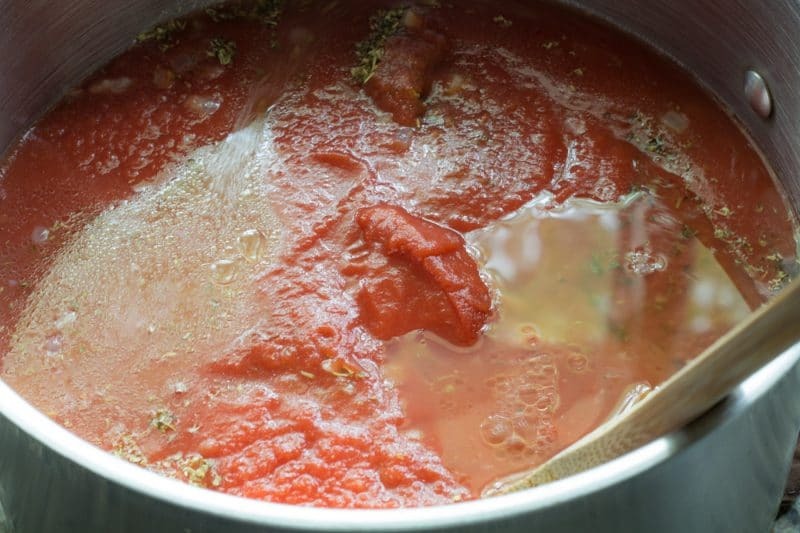 To use this easy pizza sauce sooner, skip the water and simmer for about 30 minutes. I like to add extra oregano to my pizza sauce. That preference is probably influenced by growing up on Chicago-style pizza. Feel free to leave out the additional oregano. You can also add extra spices that you like. Just a pinch of red pepper flakes would add a bit of heat if that’s the way you like your pizza sauce. We like a medium thickness sauce. All you have to do is simmer it down a bit more for a thicker sauce or add more water for a thinner sauce as you might get out of a can. 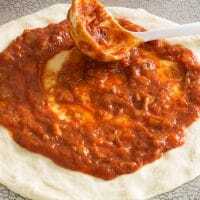 Once the sauce has been cooked, it needs to be cooled a little before adding it to a pizza crust. 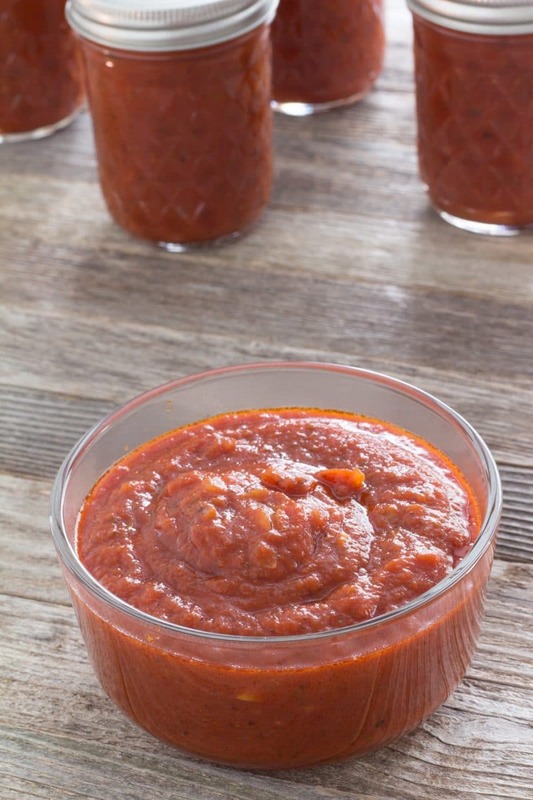 Our pizza sauce recipe can easily be doubled or tripled and it stores well in the refrigerator or freezer. The pizza sauce will keep in the refrigerator for up to 6 weeks. It can be stored in the freezer in an air-tight container for up to 3 months. I use small jelly canning jars that hold about one cup. One cup will give you enough sauce for a large extra sauce pizza or 2 pizza pot pies. Try this with our no yeast thin crust pizza dough! We are currently working on a yeast pizza dough. Subscribe to our mailing list to be notified of all our new recipes so you don’t miss it! Add butter and olive oil to a large skillet and heat until butter has melted. Add onions and cook over medium-high heat until the onions have turned translucent. Add 1 cup of water and stir to combine. Reduce heat to low and allow the sauce to simmer until thick. 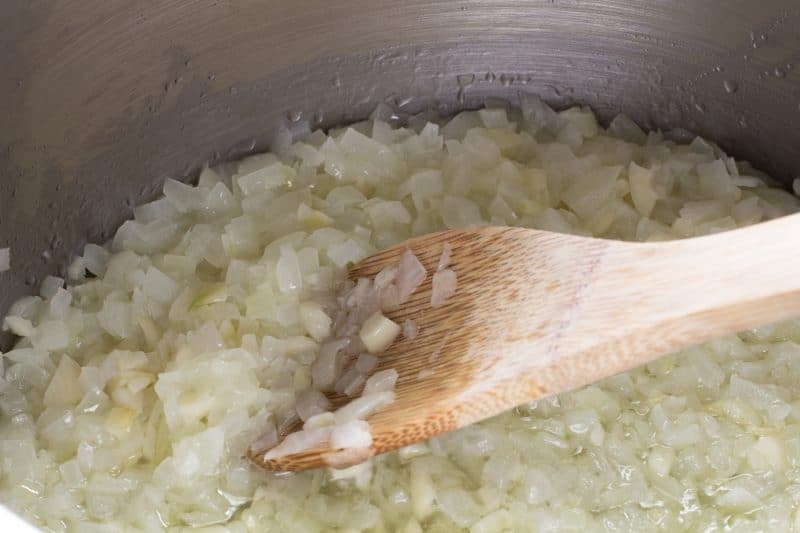 If sauce becomes too thick, add more water and simmer until desired consistency. Store leftovers in the refrigerator for up to 4 weeks or freeze for up to 3 months.